A Mass of Christian Burial for Mary Alice Scholz Ingram will be Aug. 12, 2017, at 10 am in the Minor Basilica of the Immaculate Conception Catholic Church in Natchitoches with the Rev. Scott Chemino and the Rev. Blake Deshautelle serving as concelebrants. Burial will follow in Greenwood Cemetery in Pineville under the direction of Blanchard-St. Denis Funeral Home. 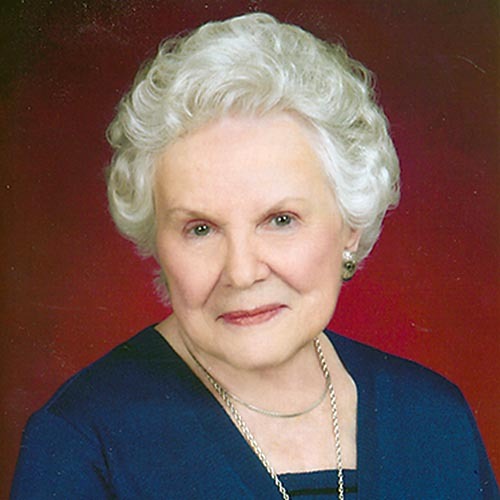 Visitation will be Aug. 11 from 6-9 p.m. in the funeral home chapel with the recitation of the Holy Rosary at 7 p.m.
Mrs. Ingram, 98, passed away Aug. 1, 2017, in Natchitoches. She was born Nov. 3, 1918, in Marshall, Texas, to Leo Charles and Edith Huggard Scholz. She began her Catholic education in Marshall and when her family moved to Alexandria, she attended St. Francis Xavier Elementary, Bolton High School and then Boyce High School where she graduated in May of 1937. On Christmas Day in 1937, in the Methodist parsonage in Natchitoches, she married Ralph Cherry Ingram Sr. who continued to be the love of her life until his death Jan. 22, 2001, after 64 years of marriage. Mary loved working in her flower garden and was known as an accomplished cook. All agreed that nothing was better than dinner in her home, where she made everyone feel welcome. Many of her friends and family were recipients of her canned pickles, jelly, cakes and pies. When her grandchildren came to visit, she always loved to have fresh brownies for them. She never missed her weekly phone calls to her sweet sister, Ruth Gallent Tuminello of Baton Rouge. She took a special interest in looking after the sick, as she served as a Eucharistic Minister, delivering communion to the homebound and patients in nursing homes. She was active in Rosary prayer groups. PEO Chapter AP held a special place in her heart as she was a member for 36 years. She will be remembered always in our hearts as a loving wife and devoted companion to her husband. She was a mother and grandmother who gave lots of hugs, kisses, praise and encouragement to her children, grandchildren and great-grandchildren. Her love for her sons and their families was boundless. She had a ready smile and was never happier than when she had the opportunity to be with her family and friends. She practiced her Christian faith daily in a way that was an inspiration and blessing to those around her. For all who knew her and loved her, she will be missed more than words can say. Mary Ingram is survived by her son, Ralph C. Ingram and wife Lucile of Natchitoches and their five children, Henry Ingram (Jane) of Lumberton, Texas, Dr. Christopher Ingram (Cathy), Dr. Mary Ingram Long (Jimmy), Dr. Michelle Ingram Mayeux (Chris) all of Natchitoches, and Dr. Cherry Ingram Horton (Leland) of Shreveport; her son, John M. Ingram and wife Sherry of Lena, and their son, John Ingram Jr. (Regina) also of Lena; her son, Neal M. Ingram and wife Kay of Longmont, Colo., and their children, Jean Ingram Martin (Alex) of Boulder, Colo., and Dr. Patrick Ingram of Madison, Wis. She is survived by 19 great- grandchildren, Hailey, Andrew, Rachel, Timothy, Daniel, Caitlin, Gabrielle, Ellen, and Zachary Ingram; Elizabeth, Mary Grace and Anne Michelle Long; Michael, Stephen, William and Matthew Mayeux; Emily, Alex and Ethan Horton; her brother, Charles Scholz and wife Sally of Houston; and a sister, Sarah Scholz Abney and husband James; as well as a number of nieces and nephews. Pallbearers are her four grandsons, Ralph Henry Ingram, Dr. Christopher Lee Ingram, Dr. Patrick Ingram and John Ingram Jr., nephew, David Gallent, and a special family friend, Dr. Fred Bourgeois. Honorary pallbearers will be her grandsons-in-law, Jimmy Long Jr., Christopher Mayeux, Leland Horton, Alex Martin and her 10 great-grandsons. Memorial contributions may be made to the Minor Basilica of the Immaculate Conception, 145 Church Street, Natchitoches, LA 71457 or to St. Mary’s School Foundation, 1101 East 5th Street, Natchitoches, LA 71457. The family extends their deep and heartfelt gratitude to Hospice of Natchitoches, the Courtyard and Mary Moran for their loving and gentle care of our very special Mother, Grandmere and Nana.